CyberLink YouCam for Windows 10 - A tool that extends the functionality of the connected Internet camera. 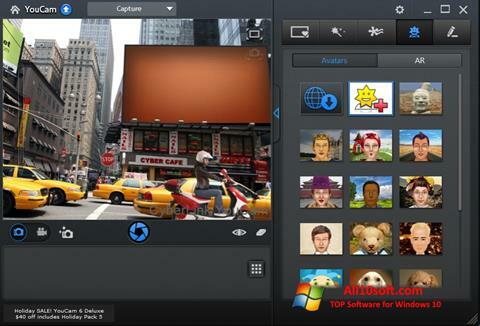 The application is able to interact with all types of video capture devices, allows you to impose on the stream streamed various filters in real time. The utility uses an extensive library of emotional, distorting and transforming effects, includes a set of frames, uses the tools of direct drawing and animation. The program contains a module for face recognition, has a tool for generating avatars, can be integrated into instant messengers and web forms on Internet resources. You can free download CyberLink YouCam official latest version for Windows 10 in English.